Check here for when and where Sherri’s teaching in the Portland Metro area and beyond! Some classes are public, although gym membership fees, studio rates, conference attendance, etc. apply. Descriptions of classes follow schedule. Want me to teach a class? Head on over to the Contact page to let me know! Look for my monthly Super Soothe workshops held the 3rd Saturday or the Friday evenings of the Equinoxes and the Solstices. All of my classes allow time for student questions about the practice. Anything from how to adapt a posture for a particular need, what breath practices offer, how to use various yoga props, to suggestions as to how to place one’s feet in a pose. Truly, all questions are welcome during all class styles! Super Soothe Saturday: This workshop style session begins with gentle Hatha movement followed by Restorative postures and ends with Yoga Nidra, a long guided meditation. This combination is designed to soothe anxiety & stress while awakening your nervous system to a deep state of rest & repair for the whole system. Yoga in Chairs: This class encourages movement through the whole body using a series of gentle seated and standing postures. Yoga postures and timing of class are adapted to seniors and is safe for many chronic health conditions. Chair support is offered to provide stability while letting students feel safe exploring movements that promote flexibility, strength, and range of motion. All postures can be done from chair. Classes are done wearing gym shoes. Class also features breath practices and chanting to benefit pulmonary health, guided meditation is offered during the resting posture at the end. Yoga for Vitality: This class is focused on teaching students cultivate vitality through a variety of yoga practices to support cardiovascular, pulmonary, and mental health while cultivating strength, balance,and flexibility. Postures are done seated in a chair, standing, and lying on the floor; instruction in using chair to move safely to and from the floor included as part of class. In addition to movement, this class features breath exercises and guided meditations. Yoga for Resiliency: Learn how to use yoga as a tool for cultivating optimal well-being for the whole mind / body system through nurturing a deep compassion for your whole self while cultivating resiliency. This class offers a combination of both held and flowing movements, along with guided meditation, to help to leave the student refreshed and relaxed. The use of props and adaptive postures are offered to help each student explore practice safely. Class ends with a deeply restorative posture. Restorative Yoga: This class slowly takes students through deeply supported poses to encourage gentle lengthening and relaxing of the body as well as stilling the busy or agitated mind. Classes sometimes include a guided meditation at the end. All levels welcome. Yoga Nidra: A long guided meditation that takes the student to a state of consciousness between waking and sleeping, that allows deep rest for the nervous system. Students often experience a feeling of well-being, reduced anxiety, and relaxation. 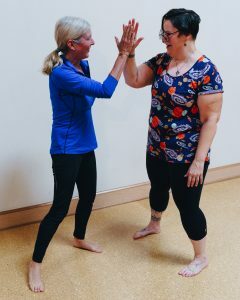 Gentle Hatha: This class offers a combination of deep stretches, some held and some while enjoying flowing movements, Vinyasa, are offered to encourage lengthening, strengthening, joint mobility, and improved balance. Pranayama (breathwork) and meditation are also included to help students feeling refreshed, relaxed, and rejuvenated. Class begins with a guided meditation and ends with a restorative posture. The use of props and adaptive postures are offered to assist each student explore practice in a self-compassionate way. All levels welcome. Metta Yoga: This workshop format class invites students to befriend their bodies through practice with Loving-kindness, or Metta, meditation while moving through gentle, flowing and held postures. Class ends with a deeply restorative posture and guided meditation. All levels welcome. Hatha Yoga: This classic style offers a combination of held and flowing postures to build strength and improve balance. Floor postures, many standing postures, and sometimes inversions and arm balances are explored in a playful, encouraging style. These classes might be gentle or more challenging, including inversions and arm balances, depending upon the needs of the students. Beginner’s Yoga / Yoga Fundamentals: A fun class that demystifies yoga Asana (postures), Pranayama (breathwork), and all those Sanskrit words. ample time is take to demonstrate techniques and includes details about the anatomy used. Classes also include modifications to make postures easier or more challenging. Includes beginning inversions, arm balances, and Vinyasa (flowing poses). All levels welcome.